37 CFR 1.610 Content of request for supplemental examination. (a) A request for supplemental examination must be accompanied by the fee for filing a request for supplemental examination as set forth in § 1.20(k)(1), the fee for reexamination ordered as a result of a supplemental examination proceeding as set forth in § 1.20(k)(2), and any applicable document size fees as set forth in § 1.20(k)(3). (1) An identification of the number of the patent for which supplemental examination is requested. (2) A list of the items of information that are requested to be considered, reconsidered, or corrected. Where appropriate, the list must meet the requirements of § 1.98(b). (3) A list identifying any other prior or concurrent post-patent Office proceedings involving the patent for which supplemental examination is being requested, including an identification of the type of proceeding, the identifying number of any such proceeding (e.g., a control number or reissue application number), and the filing date of any such proceeding. (4) An identification of each claim of the patent for which supplemental examination is requested. (5) A separate, detailed explanation of the relevance and manner of applying each item of information to each claim of the patent for which supplemental examination is requested. (6) A copy of the patent for which supplemental examination is requested and a copy of any disclaimer or certificate issued for the patent. (7) A copy of each item of information listed in paragraph (b)(2) of this section, accompanied by a written English translation of all of the necessary and pertinent parts of any non-English language item of information. The patent owner is not required to submit copies of items of information that form part of the discussion within the body of the request as specified in § 1.605(b), or copies of U.S. patents and U.S. patent application publications. (8) A summary of the relevant portions of any submitted document, other than the request, that is over 50 pages in length. The summary must include citations to the particular pages containing the relevant portions. (9) An identification of the owner(s) of the entire right, title, and interest in the patent requested to be examined, and a submission by the patent owner in compliance with § 3.73(c) establishing the entirety of the ownership in the patent requested to be examined. 37 CFR 1.610(a) requires payment of the fee specified in 37 CFR 1.20(k)(1), the fee for reexamination ordered as a result of a supplemental examination proceeding as set forth in 37 CFR 1.20(k)(2), and any applicable document size fees as set forth in 37 CFR 1.20(k)(3). See MPEP § 2810. 37 CFR 1.610(b)(1) requires that the request include an identification of the number of the patent for which supplemental examination is requested. 37 CFR 1.610(b)(2) requires that the request include a list of the items of information that are requested to be considered, reconsidered, or corrected. Where appropriate, the list must meet the requirements of 37 CFR 1.98(b). For example, the list must include a publication date for each item of information, if applicable. If the item of information is a U.S. patent, it must be identified by inventor, patent number, and issue date, as required by 37 CFR 1.98(b)(1). This list must include each of the items of information submitted with or as part of the request. See MPEP § 2809 for more information about requirements for items of information. If the item of information is a discussion contained within the body of the request, the pages of the request on which the discussion appears, and a brief description of the item of information, such as "discussion in request of why the claims are patentable under 35 U.S.C. 101, pages 7 - 11," must be listed. Patent owners are strongly encouraged to use Part B of Office Form PTO/SB/59 to provide the list. The list must be limited to the items of information for which a separate, detailed explanation is provided in the request, as required by 37 CFR 1.610(b)(5), and, of which a copy is provided with the request, when required by 37 CFR 1.610(b)(7). 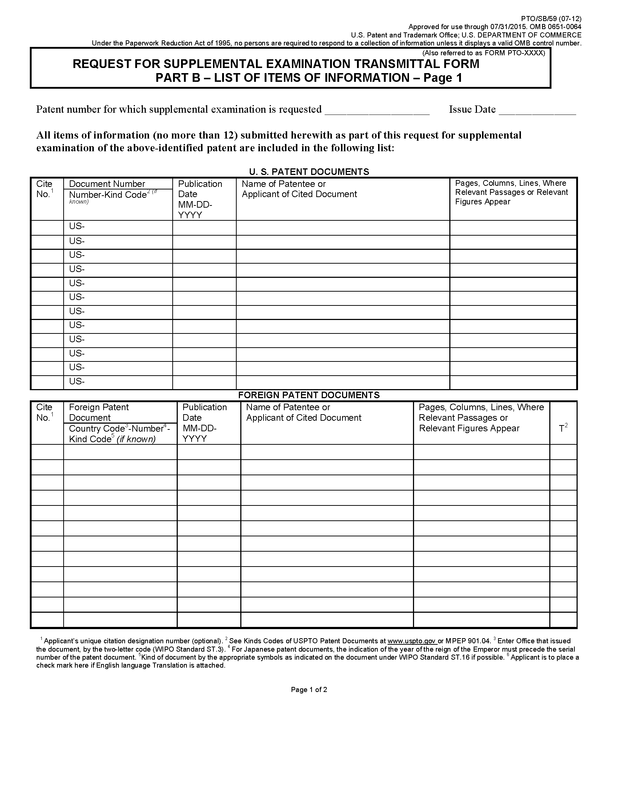 If the list contains an item of information for which the required detailed explanation and required copy (if applicable) are not provided with the request, the request may not be granted a filing date, and a notice of noncompliant supplemental examination request, informing the patent owner of the defects, may be mailed by the Office. 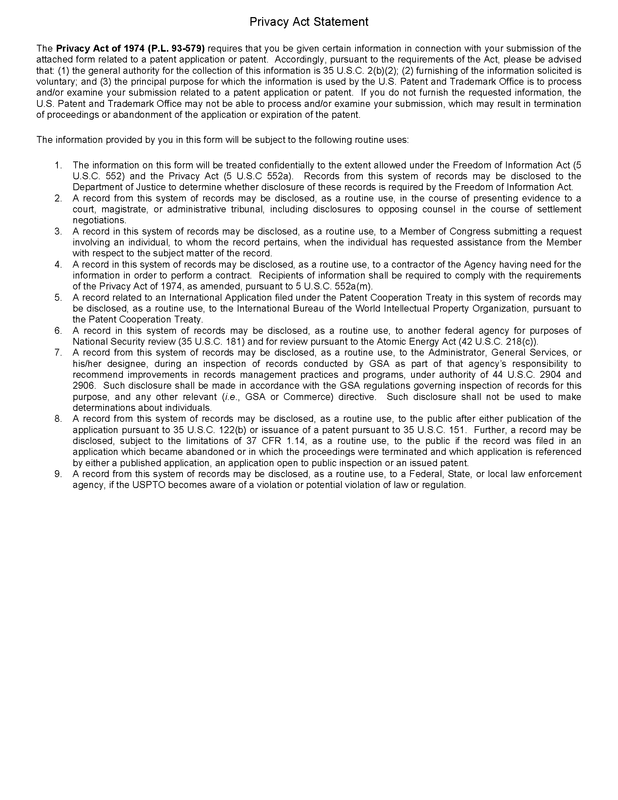 The list should identify each item of the information in a manner that clearly corresponds to any copy of the item of information provided with the request and to the detailed explanation of the manner of applying the item of information, pursuant to 37 CFR 1.610(b)(5), provided in the request. The request must include a separate, detailed explanation of the relevance and manner of applying each item of information listed pursuant to 37 CFR 1.610(b)(2) to each claim of the patent for which supplemental examination is requested. See 37 CFR 1.610(b)(5). See also subsection V below, and MPEP § 2811.01. 37 CFR 1.610(b)(3) requires that the request include a list identifying any other prior or concurrent post-patent Office proceedings involving the patent for which the current supplemental examination is requested, including: an identification of the type of proceeding, the identification of Office serial number of any such proceeding (e.g., a control number or a reissue application number), and the filing date of any such proceeding. The type of proceeding may be, for example, an ex parte or inter partes reexamination proceeding, a reissue application, an interference, another supplemental examination proceeding, a post-grant review proceeding, an inter partes review proceeding, or a covered business method review proceeding. Patent owners are strongly encouraged to use Office Form PTO/SB/59 to provide a list with a request. If such notice has not been previously provided with the request, 37 CFR 1.620(d) requires that the patent owner must, as soon as possible upon the discovery of any other prior or concurrent post-patent Office proceeding involving the patent for which the supplemental examination is requested, file a paper limited to notifying the Office of the post-patent Office proceeding. See MPEP § 2820. 37 CFR 1.610(b)(4) requires that the request include an identification of each claim of the patent for which supplemental examination is requested. The result of a supplemental examination is a determination whether any of the items of information raises a SNQ. Because patentability relates to the claims of the patent, the patent owner must identify the patent claims to be examined in order for the Office to determine whether a SNQ affecting those claims has been raised by an item of information. For example, if the information raises a question as to the adequacy of the written description portion of the specification, the SNQ pertains to the question of whether the specification provides adequate support under 35 U.S.C. 112 for the identified claim. If the information raises a question regarding whether the claimed invention may be anticipated or may be obvious, the SNQ pertains to the question of whether the identified claim is patentable under 35 U.S.C. 102 or 35 U.S.C. 103 in view of the item of information. 37 CFR 1.610(b)(5) requires that the request include a separate, detailed explanation of the relevance and manner of applying each item of information to each claim of the patent for which supplemental examination is requested. See MPEP § 2811.01 for a detailed discussion of this requirement. In addition, patent owners may also consider the guidance set forth in MPEP §§ 2214 and 2217, which govern the content of a request for ex parte reexamination. 37 CFR 1.610(b)(6) requires that the request include a copy of the patent for which supplemental examination is requested, and a copy of any disclaimer or certificate issued for the patent. A copy of the patent, for which supplemental examination is requested, should be provided with the specification and claims submitted in a double column format. The drawing pages of the printed patent are presented as they appear in the printed patent; the same is true for the front page of the patent. Thus, a full copy of the printed patent (including the front page) can be used to provide the abstract, drawings, specification, and claims of the patent for the request for supplemental examination. The printed patent is to be reproduced on only one side of the paper; submission of a two-sided copy of the patent is not proper. A "certificate issued for the patent" includes, for example, a certificate of correction, a certificate of extension, a supplemental examination certificate, a post-grant review certificate, an inter partes review certificate, an ex parte reexamination certificate, and/or an inter partes reexamination certificate issued for the patent. Any disclaimer or certificate issued in the patent generally becomes a part of the patent. Thus, a copy of each must be supplied in order to provide the complete patent. The copy must have each page plainly written on only one side of a sheet of paper. 37 CFR 1.610(b)(7) requires that the request include a copy of each item of information listed in 37 CFR 1.610(b)(2), accompanied by a written English translation of all of the necessary and pertinent parts of any non-English language document. See MPEP § 609.04(a), subsection III, for more information regarding translations of non-English language documents. The requirement of 37 CFR 1.610(b)(7) is important because it allows for all materials to be available to the examiner for full consideration within the three-month statutory time period for supplemental examination. The copy of each item of information listed under 37 CFR 1.610(b)(2) must be legible, and must be otherwise in full compliance with 37 CFR 1.52. See 37 CFR 1.615 and MPEP § 2807. The request must not include a copy of any item of information that is not listed under 37 CFR 1.610(b)(2). Items of information that form part of the discussion within the body of the request as specified in 37 CFR 1.605(b) are not required to be submitted. As discussed previously, if the information to be considered, reconsidered, or corrected is not, at least in part, contained within or based on any supporting document submitted as part of the request, the discussion within the body of the request relative to the information will be considered as the item of information, a copy of which is not required under 37 CFR 1.610(b)(7) to be separately submitted. SeeMPEP § 2809, subsection II.C. Copies of U.S. patents and U.S. patent application publications are not required, but may be submitted. 37 CFR 1.610(b)(8) requires that the request include a summary of the relevant portions of any submitted document (including patent documents), other than the request, that is over fifty (50) pages in length. The summary must include citations to the particular pages containing the relevant portions. This summary may be similar to the requirement for information disclosure statements of a discussion of the relevant and pertinent parts of a non-English language document. See MPEP § 609.04(a), subsection III. This requirement will assist the Office in treating information presented in lengthy documents within the statutory three-month time period. Patent owners are encouraged to redact lengthy documents to include only the relevant portions, unless the redaction would remove context such that the examiner would not be provided with a full indication of the teachings of the item of information with respect to the claimed invention. 37 CFR 1.610(b) requires that the request must include an identification of the owner(s) of the entire right, title, and interest in the patent requested to be examined, and a submission by the patent owner in compliance with 37 CFR 3.73(c) establishing the entirety of the ownership in the patent requested to be examined. A request for supplemental examination of a patent must be filed by the owner(s) of the entire right, title, and interest. See 37 CFR 1.601(a). This is because the scope of a patent may be changed (e.g., by cancellation or amendment of the claims) during any ex parte reexamination proceeding that may be ordered as a result of the supplemental examination proceeding, and this change must be binding on all parties having an ownership interest in the patent. Furthermore, the Office has consistently required that all parties having an interest in a patent are deemed “a patent owner” as a composite entity and must act together in proceedings before the Office. See MPEP §§ 301 and 324. This is also consistent with ex parte reexamination practice, which requires a patent owner requester of an ex parte reexamination to comply with the provisions of 37 CFR 3.71 and 3.73 for establishing an assignee’s right to take action when submitting a power of attorney. See MPEP § 2222. The Office may, under rare circumstances, permit less than all of the owners to file a request for supplemental examination if a grantable petition under 37 CFR 1.183 requesting waiver of the provisions of 37 CFR 3.71 and 3.73(c) is filed. See MPEP § 2803. An application data sheet (ADS) under 37 CFR 1.76 cannot be submitted in a supplemental examination proceeding since a supplemental examination proceeding is not an "application." Form PTO/SB/59 should be helpful to persons filing requests for supplemental examination. The use of this form as, for example, the transmittal form, list of items of information, list of prior or concurrent post-patent Office proceedings, and cover sheet for a request for supplemental examination is encouraged. 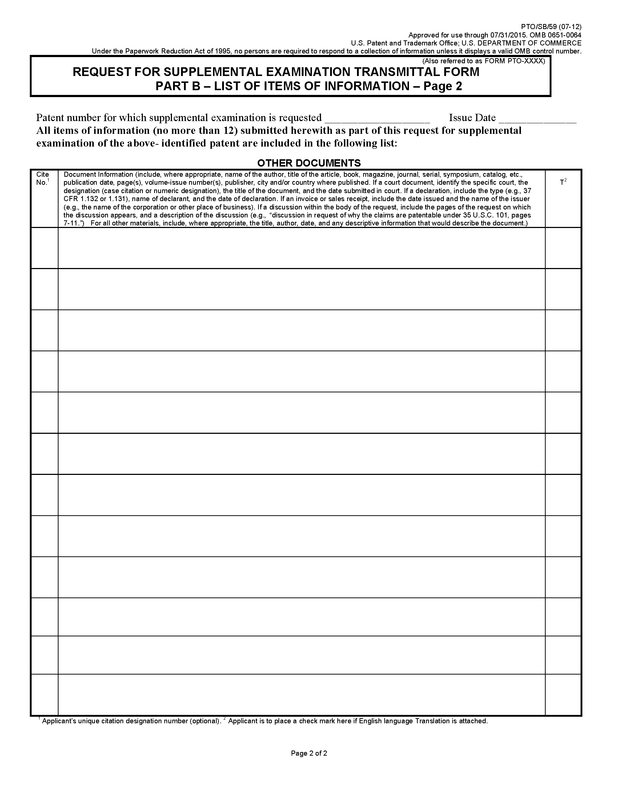 The following is a copy of form PTO/SB/59. A separate, detailed explanation required by 37 CFR 1.610(b)(5) must include, for each item of information listed pursuant to 37 CFR 1.610(b)(2), an explanation of how the item of information may be applied to the claims for which supplemental examination is requested. The patent owner must explain, for each claim requested to be examined, either (1) what the item of information teaches with respect to that claim, or (2) which teachings contained in the item of information may be considered by an examiner to be important when determining the patentability of that claim. The explanation should include citations to particular portions or figures in the item of information in which the teachings are located. Ideally, the required explanation can be provided using an appropriately detailed claim chart that compares, limitation by limitation, each claim for which supplemental examination is requested with the teachings of each item of information cited in the request. A general statement of relevance that is not tied to any particular claim limitation is not sufficient to meet the requirement. Patent owners are strongly encouraged to specify which claims are to be examined in light of which items of information. If the patent owner desires to request supplemental examination of all of the claims of the patent in light of all of the items of information submitted with the request, the patent owner is encouraged to specifically request, for example, supplemental examination of claims 1-10 (i.e., all of the claims of the patent) in light of, for example, “the following items of information” (after which a list of the items of information is provided). On the other hand, if the patent owner separately lists: 1) the claims for which supplemental examination is requested; and 2) the items of information submitted with the request, but does not specify which of the claims are to be examined in light of which items of information, the request will be taken as a request for the supplemental examination of all of the claims requested in light of each item of information submitted with the request. In either case, the patent owner must provide a separate, detailed explanation of the manner of applying every item of information submitted as part of the request to each claim for which supplemental examination is requested. The Office will assume that all of the claims identified pursuant to 37 CFR 1.610(b)(4) are requested to be considered in light of every item of information listed under 37 CFR 1.610(b)(2), unless otherwise specified. 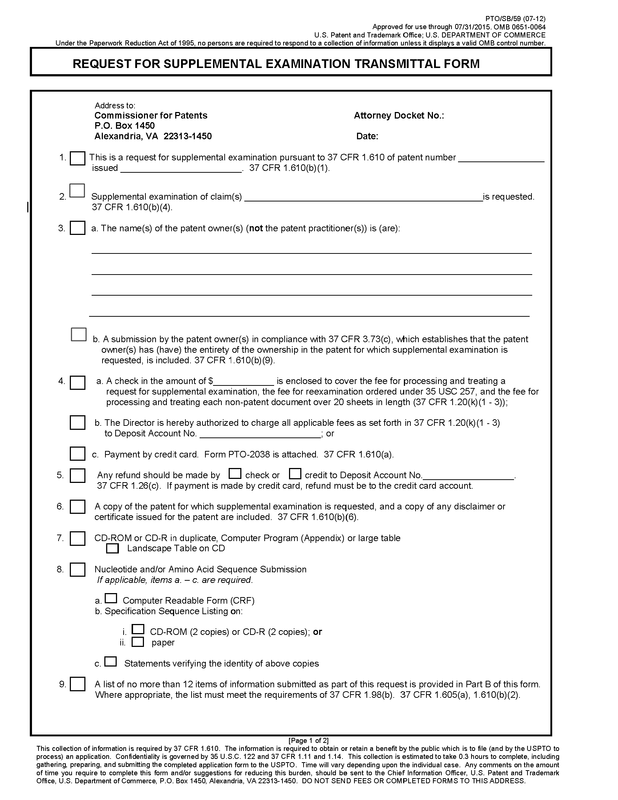 For example, if, in a request for the supplemental examination of claims 1-10, five items of information are listed, and the patent owner wishes supplemental examination of claims 1-5 based on the first two items of information and supplemental examination of claims 1-10 based on the next three items of information, the patent owner must clearly indicate which claims are requested to be examined in light of which items of information. The patent owner can provide such an indication, for example, by use of the headings in the detailed explanation as discussed below, and/or in a table of contents. A separate, detailed explanation is also required for each dependent claim for which supplemental examination is requested. If the patent owner wishes to rely upon the explanation of the manner of applying the item of information to the independent claim as the required explanation for the dependent claim, the patent owner should so state. For example, the patent owner may state: "Because dependent claims 2-5 each include all of the limitations of independent claim 1, the patent owner relies upon the required explanation under 37 CFR 1.610(b)(5) of the manner of applying the Fisher article to independent claim 1, provided above, as the required explanation under 37 CFR 1.610(b)(5) for dependent claims 2-5." The patent owner is reminded, however, that if the patent owner relies on a proper, detailed explanation of an independent claim as the detailed explanation for the dependent claims, then a review of the dependent claims may be limited to the detailed explanation of the independent claim provided by the patent owner. 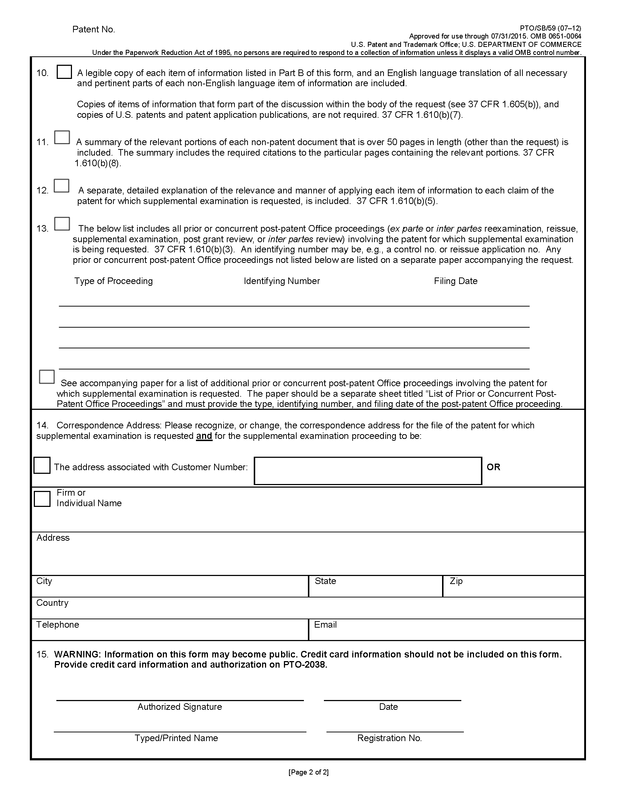 If the request does not include an explicit statement incorporating the explanation for the independent claim as the required explanation for the dependent claims, or if the request fails to include separate explanations for the dependent claims, the Office may mail a notice of noncompliant request to inform the patent owner of the deficiency. See MPEP § 2812.02. The Office does not recommend that the detailed explanation under 37 CFR 1.610(b)(5) be combined with an optional discussion, such as a discussion under 37 CFR 1.610(c)(3) of how the claims patentably distinguish over the item of information. See MPEP § 2812.02. Although the rules do not prevent the patent owner from combining such optional discussions within the detailed explanation, the Office recommends that this optional discussion be made under a separate subheading such as "Optional Explanation under 37 CFR 1.610(c)." The Office has found that requests that combine the detailed explanation with the optional discussion typically include a lengthy discussion of why the claims are patentable over the items of information, or why the items of information do not raise a SNQ, with little to no explanation as to how the item of information is applicable to the claim limitations, as required by 37 CFR 1.610(b)(5). By combining optional discussions with the required detailed explanation, the patent owner runs the risk of obscuring the “detailed explanation.” Such an obscured request could potentially result in the Office finding the “detailed explanation” was not provided, and therefore lead to a determination that the request failed to comply with the filing date requirements, and the loss of the date of the original deposit of the request as the filing date. Use of headings and subheadings in the detailed explanation section of the supplemental examination request is encouraged. For example, headings that identify each item of information and which claims are being discussed are excellent tools to ensure clarity in the explanations. In addition, under each heading, the Office highly recommends using separate subheadings for each independent claim and its associated dependent claims, if applicable. For example, the patent owner may provide a series of statements which identify which claims are to be examined in light of each item of information listed under 37 CFR 1.610(b)(2). The statements do not need to take the form of a proposed rejection, but should be sufficiently clear to determine the scope of the request. These statements will NOT be construed as an admission of unpatentability. These statements would only indicate that the patent owner is requesting that the Office consider whether certain issues may be raised by each item of information with respect to specific claims. If the patent owner is aware, or is made aware, that an item of information may raise particular patentability issue(s) (e.g., anticipation, obviousness, written description, enablement, etc…), the patent owner may identify these issues in the explanation under 37 CFR 1.610(b)(5). These statements would provide a focused review on the potential issues and explicit consideration of those potential issues on the record. Supplemental examination is requested for claims 1-10 of the ‘123 patent in view of the Fisher article. The patent owner requests the Office to consider whether the Fisher article raises a SNQ affecting claims 1, 4, 7, and 15 of the ‘123 patent. Does Smith raise a SNQ affecting claims 1-3 and 5-7? Does the Byrd declaration raise issues under 35 U.S.C. 101 affecting claims 1-7? Does the Byrd declaration raise issues under 35 U.S.C. 112 affecting claims 2 and 8? Are claims 1-5 entitled to the earlier filing date of March 5, 2008 in light of the Wolf declaration? Patent owners are encouraged to be as comprehensive as possible in the explanation. This allows the patent owner to frame any potential issues, and assists the examiner in focusing on these potential issues to better determine if a SNQ is, or is not, raised. See also the guidance provided in MPEP §§ 2214 and 2217 for ex parte reexamination proceedings. Any failure to provide the required explanation for any item of information, or for any claim for which supplemental examination is requested, will be identified in a "Notice of Noncompliant Supplemental Examination Request (37 CFR 1.610(d))." See MPEP § 2812.02. Even if the request fails to strictly comply with the detailed explanation requirement, the Office may, in its sole discretion, accept the request if it is readily understood from the explanation provided in the request how the each of the items of information submitted with or as part of the request may be applied to each of the claims for which supplemental examination is requested. The requirement for a detailed explanation may not be met by incorporating by reference a paper from another proceeding, or by relying on a paper of a third party, which is submitted with the request. A request for supplemental examination must stand on its own. A request for supplemental examination cannot be made, and the requirements for a detailed explanation pursuant to 37 CFR 1.610(b)(5) cannot be satisfied, by incorporating by reference a paper from another proceeding. A paper filed in another proceeding must comply with the regulations and procedures set for that proceeding, and would address the issues specific to that proceeding, not to the present supplemental examination proceeding. A procedure which would require the examiner to sort through a paper filed in another proceeding and determine which issues may be raised and treated in a supplemental examination proceeding would frustrate the Office’s ability to conclude the supplemental examination proceeding within three months of the filing date of the request, as required by 35 U.S.C. 257. For example, the patent owner cannot rely on an Office action from another proceeding as the detailed explanation required by 37 CFR 1.610(b)(5) of the manner of applying the references cited in the Office action. Incorporation by reference would require Office staff to review any incorporated papers (such as, e.g., an Office action) to see if the papers happen to include a discussion of each item of information identified in the present supplemental examination proceeding and explain, in detail, how each item of information may be applied to each claim for which supplemental examination is requested, in order to determine if the filing date requirements are met. Such a procedure would absorb a greater portion of the three-month time period for conducting the supplemental examination and reduce the time available for a full and comprehensive analysis of each item of information submitted as part of the request. For these reasons, each request must stand on its own. The requirement for a detailed explanation cannot be satisfied by incorporating by reference a paper from another proceeding. The detailed explanation must reflect the opinion of the patent owner, and not that of a third party (including a patent examiner). 35 U.S.C. 257(a) specifies that a patent owner may request supplemental examination. The statute does not authorize the Office to accept a request for supplemental examination by a party other than the patent owner. The patent owner may not file papers on behalf of a third party and thus circumvent the intent of the legislation for supplemental examination. For this reason, the detailed explanation required under 37 CFR 1.610(b)(5) must be drafted by the patent owner, and must reflect the opinion of the patent owner, i.e., what the patent owner believes is the relevance of each item of information, and what the patent owner believes is the manner of applying each item of information to each claim of the patent for which supplemental examination is requested. The patent owner may not rely on a paper filed by a third party (including a paper drafted by a patent examiner) to provide the detailed explanation required by 37 CFR 1.610(b)(5) because the paper filed by the third party does not necessarily reflect the opinion of the patent owner. If the patent owner wishes to have the examiner consider, in a supplemental examination proceeding, an Office action from another application or proceeding, the patent owner must separately list the Office action and any documents mentioned in the Office action as items of information pursuant to 37 CFR 1.610(b)(2), and provide, when required under 37 CFR 1.610(b)(7), copies of each item of information. In addition, the patent owner must supply its own detailed explanation under 37 CFR 1.610(b)(5), of how the Office action and any documents mentioned in the Office action may be applied to the claims for which supplemental examination is requested. If the request includes an item of information limited to a correction of factual information, such as a foreign priority or domestic benefit claim, or the common ownership of the claimed invention, the request should also include one or more additional item(s) of information that potentially provide evidence that the patentability of the claims depends upon the factual information to be corrected. See MPEP § 2809.01. In such a case, the request must include a detailed explanation required under 37 CFR 1.610(b) of how each of the additional item(s) of information may be applied to the claims for which supplemental examination is requested. For example, if the patent owner wishes to correct the effective filing date of the patent to be examined by claiming the benefit of an earlier filing date of, e.g., a parent patent, the request should include a copy of the parent patent as a first item of information, and a copy of an intervening reference as a second item of information. The patent owner must include in the request a detailed explanation of how the intervening reference may be applied to the claims of the patent to be examined if the effective filing date remains unchanged and is not corrected. As another example, if the patent owner wishes to delete a benefit claim, or correct an earlier-obtained (incorrect) benefit claim in order to properly claim the benefit of a later filing date of a parent patent, the request should include, as separate items of information, a copy of any parent patent document on which the later (corrected) effective filing date is based, and a copy of an intervening reference which would pre-date the effective filing date of the patent to be examined, if the domestic benefit claim were deleted or corrected to an appropriate later date. In this case, the patent owner must include in the request a detailed explanation of how the intervening reference may be applied to the patent claims if the effective filing date of the patent to be examined is corrected to the later date. The request must also include an explanation of how the patent owner is entitled to the corrected factual information, where appropriate. For example, if the patent owner informs the Office that the effective filing date of the patent to be examined should reflect an earlier filing date of a parent patent, then the patent owner must also include in the request a detailed explanation of how the patent owner is entitled to the earlier effective filing date, by, for example, explaining how each claim limitation is supported by the parent patent. If, however, the patent owner merely wishes to delete a foreign priority or domestic benefit claim, an explanation of how the patent owner is entitled to the (new) effective filing date, if the domestic benefit claim (or, where appropriate, the foreign priority claim) is deleted, is not required. A request for supplemental examination includes an item of information limited to the correction of the effective filing date of the patent, such as a copy of a parent patent and a discussion within the body of the request limited to how the effective filing date should be corrected, i.e., by changing the effective filing date of the patent to be examined to the earlier filing date of the parent patent. The request also includes a second item of information, i.e., an intervening reference, which causes the patentability of the claims to depend upon the domestic benefit claim. In such a case, the patent owner must include in the request a detailed explanation of how the intervening reference may be applied to the claims for which supplemental examination is requested, if the effective filing date of the patent to be examined remains unchanged and is not corrected. The patent owner must also include a detailed explanation of how the patent owner is entitled to the earlier effective filing date, by, for example, explaining how each claim limitation is supported by the parent patent. (4) An explanation of why each item of information submitted with the request does or does not raise a substantial new question of patentability. 37 CFR 1.610(c)(1) permits the request to include a cover sheet itemizing each component submitted as part of the request. A "component" may be a certificate of mailing, the request, the patent to be examined, an item of information, and any other separate document that is deposited with or as part of the request. Submission of a cover sheet will assist the Office in the review of the request for compliance with the filing date requirements. For example, the Office may readily recognize that certain components listed as submitted on the cover sheet may be missing from the file and quickly contact the patent owner for correction. The Office encourages patent owners to submit a cover sheet with a request for supplemental examination. Use of the form PTO/SB/59 as the cover sheet is particularly encouraged. 37 CFR 1.610(c)(2) permits the request to include a table of contents for the request. Submission of a table of contents will provide clarity to the record and also help ensure that the request includes all of the required elements in accordance with 37 CFR 1.610(a) and 37 CFR 1.610(b). In addition, a table of contents will also assist in the initial review of the request to determine if the filing date requirements are met and in the examiner’s analysis of the request during the supplemental examination proceeding. 37 CFR 1.610(c)(3) provides that the request may include an explanation of how the claims patentably distinguish over the items of information. This optional discussion should be separately made under a separate subheading such as "Optional Explanation under 37 CFR 1.610(c)(3)." The Office has found that requests that combine the detailed explanation under 37 CFR 1.610(b)(5) with the optional discussion under 37 CFR 1.610(c)(3) typically have a lengthy discussion of why the claims are patentable over the items of information with little to no explanation as to how the item of information is applicable to the claim limitations as required by 37 CFR 1.610(b)(5). By combining the optional discussion with the required detailed explanation, the patent owner runs the risk that the Office will find that the required explanation was not provided, causing the request to be noncompliant, and the loss of the date of the original deposit of the request as the filing date. See MPEP § 2812.02. 37 CFR 1.610(c)(4) provides that the request may include an explanation why each item of information does or does not raise a SNQ. Patent owners are encouraged to submit this explanation, which will assist the Office in analyzing the request. If the patent owner does submit this optional content, particularly where the patent owner explains why each item of information does not raise a SNQ, the Office strongly recommends that this optional discussion be separately presented, in the request, from the explanation required by 37 CFR 1.610(b)(5), under a subheading such as "Optional Explanation under 37 CFR 1.610(c)(4)" . See MPEP §§ 2811.01 and 2812.02.